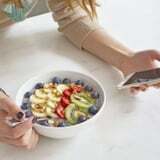 One of the most common questions NASM-certified personal trainer Sam Altieri’s clients ask is: “How many calories should I eat?” It can be confusing, and depending on your goals, that number will be different for everyone. “If you’ve been worrying about trying to find the ‘perfect’ calorie number to aim for, I would encourage you to just start in a general range, eat within that range consistently, and adjust from there depending on the results!” Sam wrote in her Instagram caption. Use the formula above to figure out that number. In the example above, she uses 130 pounds as the bodyweight. To lose fat, you’d eat a range between 1,300 and 1,560 calories. To maintain your weight, you’d consume 1,820 calories. If gaining muscle is your goal, aim for 2,080 to 2,340 calories. As a starting point for what to eat, Sam said to aim for 0.7 to 1.5 grams of protein per pound of bodyweight. Then the rest of your calories can come from whatever combo of fats and carbs you prefer. What if you want to lose fat but also gain muscle? Sam recommended picking one and sticking with it for a while, usually fat loss first. Then you can slowly add in more calories over time to build muscle!